One of the great things about attending comic book conventions (as I did recently at the excellent Heroes Con in Charlotte, NC) is that you sometimes discover hidden gems. Thanks to my friend James (who actually did the discovering part) I met "J," the prefers-to-be-anonymous writer and artist of the series Farlaine the Goblin (the character's name is pronounced "Far-lin"). There are 100 forests available, and he's visited 90 of them - so Farlaine has 10 more chances to find a home. Accompanied by his "friend," the plant / shrub Ehrenwort, he encounters many adventures and dangers along the way, and survives only by his wits and his plant-growning abilities, which comes in handy when you're attacked by giant centipedes - or an army of killer robots! The art is wonderful - whimsical, but with a great sense of a "real / fantasy" world, with lush environments and odd creatures. The series channels some classic comics without ever stealing from them - including Carl Barks' Scrooge McDuck stories, Jeff Smith's Bone, and Walt Kelly's Pogo. The story is great fun - inventive and humorous without being silly (well, it has just the right portion of silly), and it's well worth tracking down - it's for all ages! 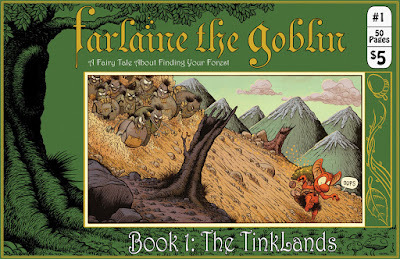 You can track down issues at the website www.farlaine.com - highly recommended!